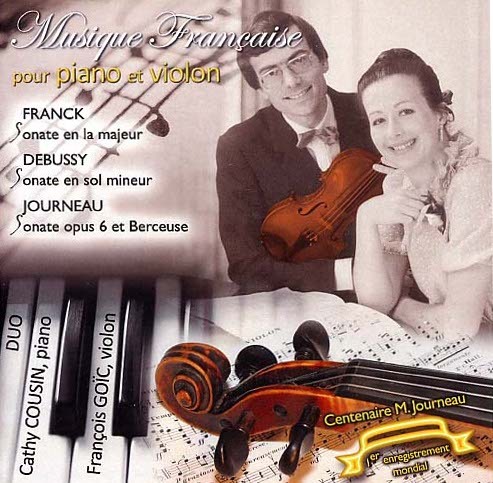 Title : "Musique française pour piano et violon"
Franck : "Sonate en la majeur"
Debussy : "Sonate en sol mineur"
"Interlignes", bulletin de communication interne de la FNCMR (Fédération Nationale des Centres Musicaux Ruraux). The CD is a sample of quite rare music for piano and violin and a recording of historic interest (first world recording for the composer's centenary) thanks to a permanent piano and violin duet, well-known in festivals organized in the Center of France and in Strasbourg. The sonata (opus 6), technically, gives an important part as much to the piano as to the violin, according to the composer himself. The "Berceuse" (opus 22) is a very short piece composed in 1935 and still unpublished, premiered by Gil Graven, a french international soloist.